And you thought doubleheaders were exhausting. 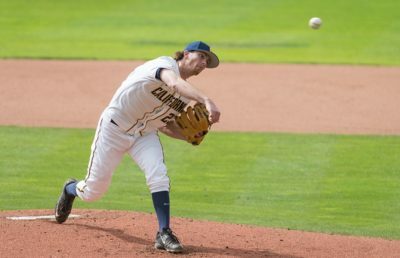 With April showers bringing a delay of several hours, Cal baseball completed the marathon to end all marathons Saturday afternoon — one that spanned approximately six hours and would warm the heart of the late Ernie Banks. On Saturday, Cal played the remainder of Thursday’s rain-shortened game one, as well as the entirety of games two and three. Once the last out was recorded, the Bears emerged with two wins and a series victory. With the series win, the Bears improved to 14-5 on the season at Evans Diamond. The first game of the series began Thursday night, but right before the beginning of the eighth inning, play was suspended for the rest of the night because of rain. The downpour continued throughout Friday, forcing both squads to reconvene Saturday around noon — good for a 39-hour rain delay. 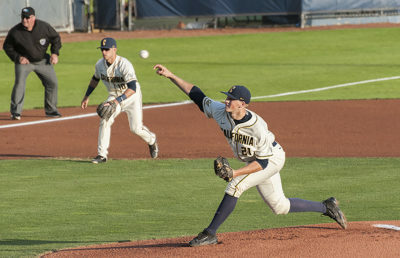 Junior Tanner Dodson had another dynamic series for Cal. At the plate, Dodson recorded four RBI and five hits in 13 at-bats, pushing his hitting streak to eight games. During this stretch, the junior has had a batting average of .419 and improved his season average by 32 points. Cal’s two-way star didn’t have his sharpest stuff on the mound this time around, allowing three runs over three innings in relief, but Dodson was sharp enough to preserve the Bears’ lead and record his sixth save of the season in game one. The multi-inning save has become something of a Dodson speciality. Of the six saves he ’s recorded this season, only one has been of the one-inning variety. 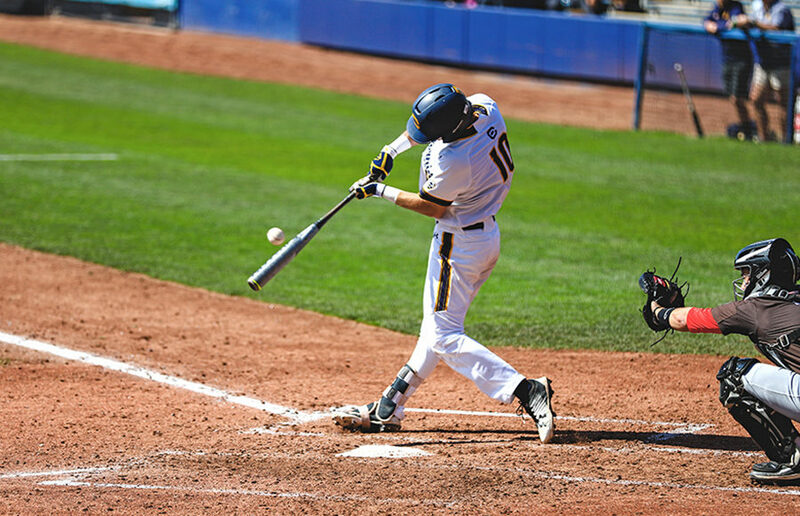 Despite Dodson’s fine series at the plate, Utah junior DaShawn Keirsey Jr. unquestionably had the best weekend of any player to come up to the plate. Keirsey lit up Cal’s pitching all series long, recording seven hits and four RBI with a pair of home runs, both of which came on the same day. 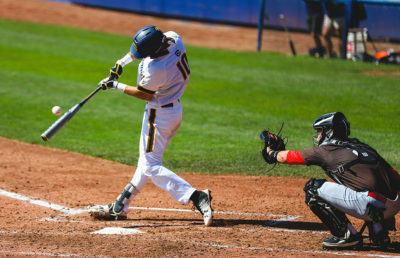 After struggling at the plate over the past couple weeks, Cal junior Jeffrey Mitchell Jr. finally emerged and put together a solid series, going 4 for 10 with three RBI. Sophomore Andrew Vaughn was relatively quiet at the plate, but he still managed to reach base five times in the series. Senior Matt Ladrech threw six innings of two-run ball, and Mitchell knocked in a pair of runs en route to a narrow 7-6 victory. With the help of a bit of sloppy defense, Utah jumped out to a 3-0 lead, but Cal responded late with six unanswered runs and would retain the lead for the rest of the ballgame. Ladrech has been nothing short of stellar for the Bears as of late, allowing five earned runs over 17.1 innings pitched in his last three starts. The senior has chopped a full run and then some off his season ERA, reducing it from 5.70 after his start against Oregon State to 4.39. Both squads engaged in a classic slugfest, totaling a combined 22 runs and 29 hits, but it was the Utes that walked away with a 12-10 victory. Amid all the offensive fireworks, Keirsey found a way to steal the show, crushing two home runs, collecting four RBI and reaching base five times. Keirsey, who has only recorded is far from a slugger — the junior only has seven career home runs, including the two he hit in this game — all the more reason as to why his afternoon was so memorable. Dodson and freshman Darren Baker had excellent afternoons, each putting together a three-hit day. This game belongs to junior Aaron Shortridge. Coming off another excellent start last weekend against UCLA, Shortridge outdid himself once again, pitching a beauty of a complete game, striking out nine while allowing one run to secure a 5-1 win. A short start looked in order when Utah scored a run in the first, but Shortridge settled into a groove and, at one point, retired 11 straight batters. By the time the Utes broke Shortridge’s streak of retired hitters, the Bears mounted a 4-1 lead and the junior was cruising. Rather fittingly, Shortridge ended his career game with a strikeout to seal the victory and the series win.